Tabula was originally the Latin word for “board”. A board for writing on as well as for displaying or archiving things. Later, the term was also coined to mean ironing board (the “table tavola” by Italians or “tabula” by the Portuguese). So why Atabula? What is Atabula? Atabula is an online information platform, a media channel, a community, a following… First there’s Franck, then Ezechiel and many more; Atabula is the URL (or web address) where all this can be found. Atabula is a kind of encyclopedia used by France’s Food community. It contains cryptic or in-depth descriptions of new products, things you need to know, trends, artisan suppliers – it deciphers information of all kinds. Atabula is something you consult every day, an absolute must. Atabula’s website now includes a directory of food experts in which we are featured. The Atabula Food’s Who’s Who! 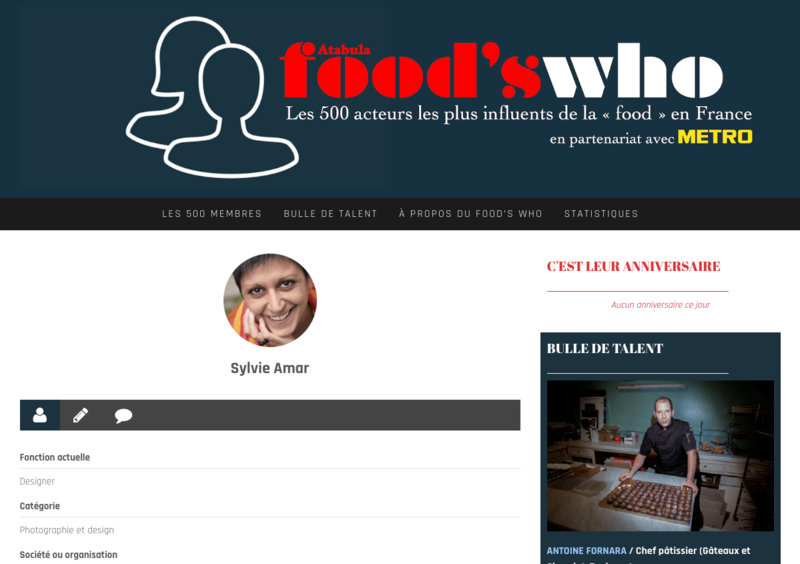 A listing of the 500 greatest food influencers in France. And Sylvie Amar is part of it!